Making video and audio fully searchable and accessible worldwide. Finally! 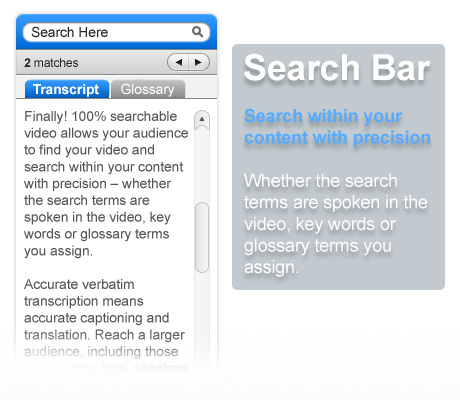 100% searchable video allows your audience to find your video and search within your content with precision – whether the search terms are spoken in the video, key words or glossary terms you assign. Accurate verbatim transcription means accurate captioning and translation. Reach a larger audience, including those with hearing loss, speakers of foreign languages and others. Customize the Transendia player to look and search the way you specify. 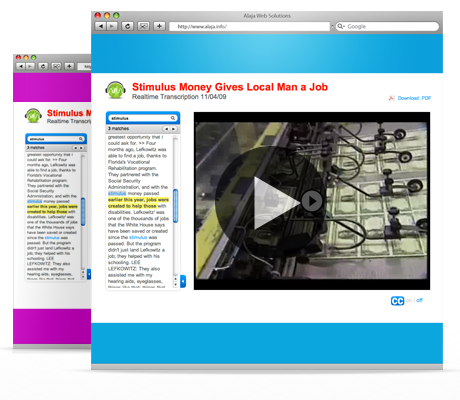 Integrate robust video search into your own website today! One great media player, three transcription options. Whether you bring your own or have us stream a realtime transcript with a live event, we can handle it. Why can't anyone find my video? Until now, video and audio files could not effectively be searched by the popular search engines. Our patent-pending technology ensures that your video content is delivered in as little as two mouse clicks!